Choosing well means knowing what you’re looking for. When it comes to tire information, everything about it is written on the sidewall. Aside from the tire brand and model, it shows the tire’s basic standard dimensions along with the tire’s maximum inflation pressures, speed and load ratings. It also specifies the types of materials used in manufacturing as well as those that reinforce the rubber. Most importantly it shows the date and week the tire was produced along with the compliance codes and certification that the tire meets the various industry standards and measures up to the government regulations. 15: This refers to the Wheel Diameter that will fit inside the tire. Load Index: The two-digit number code (89) immediately found after the tire size, stipulating the maximum load (mass, or weight) that each tire can carry. 85 = 1,135 pounds Speed Rating: The letter (H) that follows after the numerical Load Index, referring to the maximum speed that the tire can withstand. (H=130mph/210kph). A few years ago it was believed that a Z rating (149-mph plus) was the highest a tire could achieve. But with the recent introduction of powerful exotic supercars that can surpass that number, new W and Y, Z ratings were developed. Uniform Tire Quality Grade, or UTQG. 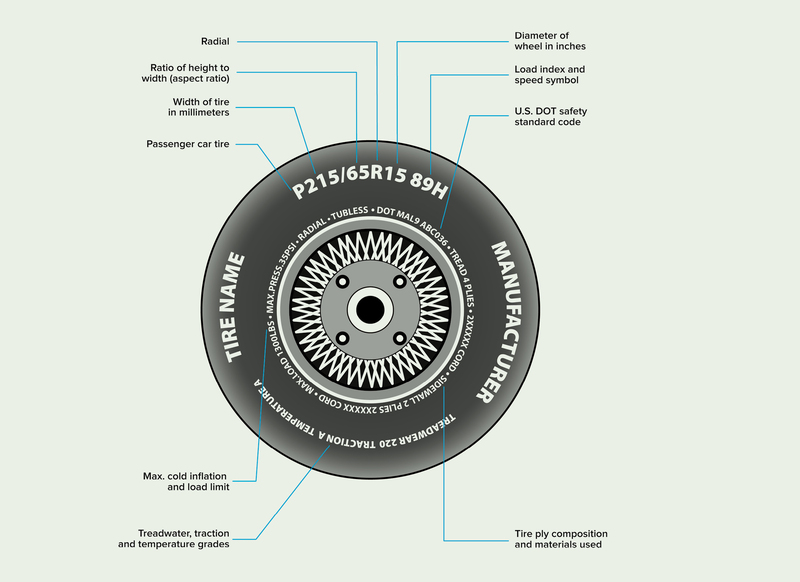 These are ratings required by the U.S. Department of Transportation indicating the tire’s Treadwear, Traction, and Temperature Resistance. Treadwear: This number is based on the wear rate of the tire when tested under controlled conditions on a specified government test track. A tire graded 200 would last twice as long on the government test course under specified test conditions as one graded 100. Typically, higher Treadwear numbers signify that the tread of a tire should last longer and lower numbers mean it should wear out faster. Since 2000, the week and year the tire was produced has been provided by the last four digits of the Tire Identification Number with the 2 digits being used to identify the week immediately preceding the 2 digits used to identify the year. With a lifespan of just 5 years, tires also expire. As such always look for the date of manufacture to ensure you’re not getting old tires.